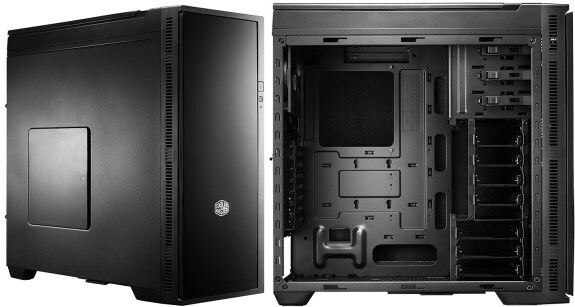 Cooler Master shows off the Silencio 652S, a new case that focuses on silent computing. It will ship this month for 99EUR (incl. VAT). Cooler Master, a leading creator, innovator and manufacturer of desktop components and more, today announced a revision of the stylish mid-tower Silencio 652, the Silencio 652S. Representing the best solution for sound absorption with system builds of all levels, the Silencio Series delivers ultimate performance with minimal noise. Sound silencing foam padding seeks to severely reduce system noises produced by hard drives, numerous cooling fans, and other devices. Combine this with a solid-steel frame, vibration inhibiting rubber feet, 3x 120mm Silencio FP 120 and the Silencio 652S operates with minimal noise. The difference between the Silencio 652 and the Silencio 652S is the implementation of new fan technology. Included are 3 120mm Silencio FP 120 fans. The front 180mm has been replaced by 2 Silencio FP 120 fans. The rear 120mm standard fan has also been replaced by a Silencio FP 120 fan. The patented Silencio FP 120 fans, implemented in the Silencio 652S, gives users the ultimate silent cooling experience. Each fan is equipped with large fan blades and with its proprietary technology produce less noise while creating high air pressure. The bearings in these fans are superior to standard fans. The loop dynamic bearings give the fan a life expectancy of 160,000 hours. Another feature of the loop dynamic bearing is the IP6X dustproof design. These fans will run, silent, for a long long time. Why the Silencio FP 120? The fan blades of the Silencio FP 120 are designed to create a high pressure. In most chassis the harddrives are located at the front of the chassis which limit airflow from the front fans. In the Silencio 652S the Silencio FP 120 fan increases the intake of fresh air because the increased pressure forces more air into the chassis (and trough the harddrive cages).At the back of the chassis the Silencio FP 120 takes out more heat compared to standard fans. Look beyond the matte exterior of the Silencio 652S to find a sleek, intuitive, and spacious interior. Support for up to a three 5.25" bay devices, and nine 3.5" drives / ten SSDs via the HDD/SSD combo cage are built into this silent chassis. Silencio 65S2 easily supports installation of high-end graphics cards up to 423mm long. Dual USB 3.0 and a versatile SD card reader provide users with several ways to connect data on-the-fly. Removable covers on the top and side panel allow users to choose their preferred balance of silence and airflow. Easily removable dust filters in the front, top, side panel, and bottom protect precious system components from potentially dangerous dust build-up over time. Users taking the next step in silent cooling may opt for a custom or AIO liquid cooling setup. The Silencio 652 includes support for the installation of a large 240 (2 x 120mm) radiator in the front or top and a 120mm radiator in the rear. A modern and reserved exterior design, high internal expandability, and a reasonable price make the Silencio 652S the perfect silent partner for any enthusiast.